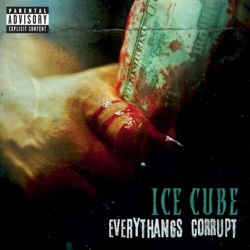 Everythang's Corrupt is the 10th studio album by Ice Cube, released by Lench Mob Records and Interscope Records on December 7, 2018. Overall, the 16-track project is mostly cohesive aside from the few disposable tracks that clutter its message and, at times, elementary lyrics. Moments of rap brilliance—in which lyrics, beat, subject matter and the hook all hit—are now few and far between, despite his best efforts. Ice Cube’s social consciousness make Everythang’s Corrupt a refreshing release. Late 90s satisfied Ice Cube might be fun, but pissed off 2018 Ice Cube is what we need. Yapping and whining by wealthy African. Angry, rich black-man whining and trying to rhyme. He is better off trying too make another Friday movie. This old man stays whining and angry in his so called raps with wack beats. Good Music Finally, the rap ancestor is makin’ a long awaited album!! Ice Cube for President! To all the 1 star reviews Stop talking about what you don’t know about. Ice Cube is a pioneer in political rap. I recommend listening to song titled “Hello” with Dr. Dre. Better yet, listen to all of his music...starting with Straight Outta Compton. What the? The pre-order single is enough for me to rate this a 1 star and write this review. What a dumb song. Come on Ice cube and Co. Disappointed. The beat is sick, but the lyrics to arrest the president is just garbage, doesn’t matter if you are pro or anti trump. Come on, you can do better, hopefully People will agree.